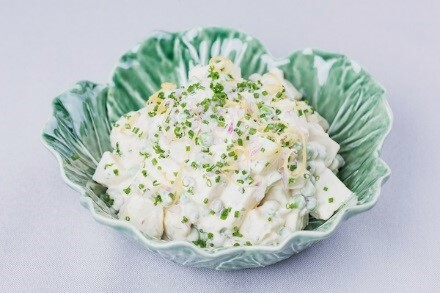 This delicious recipe will make your potato salad or coleslaw simply scrumptious. Use your favourite mustard to make this dressing. We used mild American mustard to make this potato salad with cubed potatoes, cooked peas, capers, and chopped red onion. Mix the mayonnaise, vinegar, mustard, lemon rind and juice and chives together. Use a rubber scraper to mix through cooked potato cubes for a potato salad or shredded cabbage and other vegetables for a coleslaw.